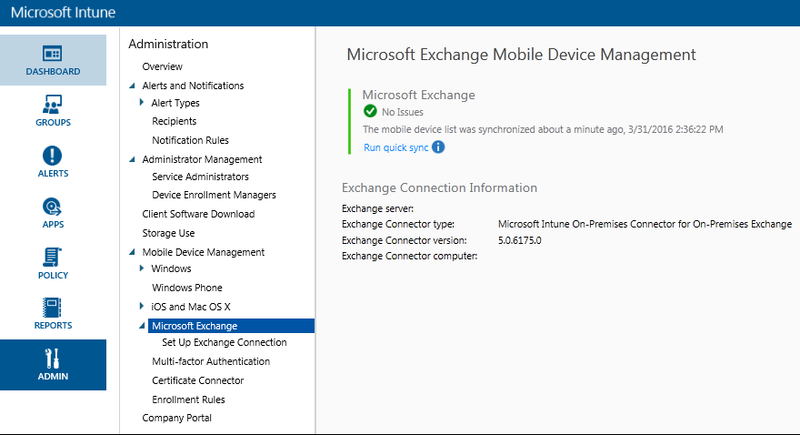 For those who are using On-Premises Exchange or Hosted Exchange with Microsoft Intune (standalone) hereby a quick post to inform you the Microsoft Intune Exchange connector (5.0.6175.0) has been updated last month (March 2016). At time of writing no release notes were available what has been addressed with the updated connector. We’re updated successfully from version 5.0.5879.0 with On-Premises Exchange 2013 environment. The latest version of the Microsoft Intune Exchange connector can be downloaded from the Microsoft Intune admin console. Based on your notification settings you’ll receive an e-mail or will be notified through your alert dashboard overview. where is the change log for this?